The Blog Of Johno His name is Adam Johnson but everyone calls him Johno so he thought he would write a personal blog. Covering world issues and anything interesting. He loves Photography and uploads some of his work frequently, he also loves making films/videos and is working on a few at the moment. Johno is very creative and enjoys sharing his creations with the world. 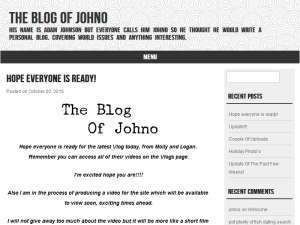 This what your The Blog Of Johno Blog Ad will look like to visitors! Of course you will want to use keywords and ad targeting to get the most out of your ad campaign! So purchase an ad space today before there all gone! If you are the owner of The Blog Of Johno, or someone who enjoys this blog why not upgrade it to a Featured Listing or Permanent Listing?